This page contains research that was performed by the rocket team with which I participate. Although the data appears on my site, the credit for the research resides with all of the hard working members of the team. If you have suggestions of comments on the research, please contact us by going to www.rafresearch.com/contact.html. Our post-mortem analysis following the 2007 ARLISS Launch, surfaced the desire to reduce the time needed to turn-around an ARLISS rocket for another flight. A substantial portion of this turn-around time resulted from the need to disassemble our Avionics Compartment to replace batteries. This was necessary, because our flight computer drew about 100 mA while sitting on the launch pad waiting to be launched. Since the typical 9V alkaline battery lasts about 2.5 hours at this discharge rate and liftoffs are sometimes delayed, we decided that the "electronics battery" needed to be changed after every flight. We examined redesigning the compartment to permit battery replacement without disassembly, but decided instead to replace the 9V alkaline batteries with rechargeable batteries. The compatible NiMH 9V (actually 8.4V) batteries are rated for less than half the energy capacity of the 9V alkaline batteries and so were eliminated from consideration. The energy density of Li-Ion Polymer (Li-Po) rechargeable batteries looked very attractive, so we explored them as an option. 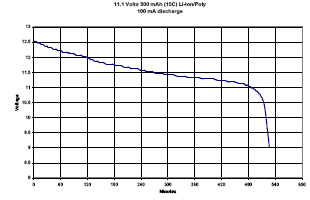 The nominal voltage of a Li-Po battery cell is 3.7V (about 4.23 V when fully charged). Two and three cell batteries are available giving us a choice of 7.4 or 11.1 volts. 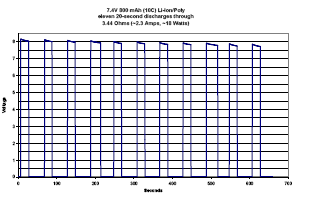 Li-Po batteries can supply substantial current, 6A continuously and 12A for short (30-second) bursts. Li-Po cells have a flexible, foil-type (polymer laminate) case. Since no metal battery cell casing is needed, Li-Po batteries are very light. Because of the lack of metal casing and less space used in intercell spacing, the energy density of Li-Po batteries is over 20% higher than that of a classical Li-ion battery and store more energy than nickel-cadmium (NiCd) and nickel metal hydride (NiMH) batteries of the same volume. Care must be taken in using Li-Po batteries. Their ability to deliver high burst currents, lack of a rigid case, and overcharging sensitivity presents both electrical and thermal hazards. Intelligent chargers designed specifically for Li-Po batteries must be used to recharge these batteries. Overcharging a Li-Po battery will likely result in explosion and/or fire. Li-Po cells must not be discharged below 2.75V per cell, or else the battery will subsequently no longer accept a full charge and may experience problems holding voltage under load. Three Duracell MN1604 Copper-Top 9V batteries that were new (dated to expire 48 months after the test date). Two Duracell MN1604 Copper-Top 9V batteries that were at expiration (dated to expire the month we tested). These batteries were stored for years at room temperature, but never used. We selected Duracell batteries due to the recommendation of the manufacturer of our flight electronics. Apparently, their welded cell interconnect construction makes these batteries much less prone to drop-outs caused by high G-forces. One Tenergy 11.1V 800mAh (10-15C) (no model number printed on battery). Recharging was performed with a Tenergy Universal Smart Charger (TLP2000, for 1 to 4 cells, non-balancing). 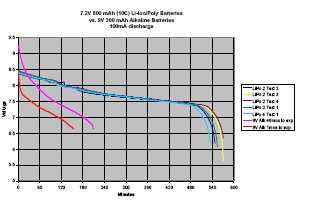 A concern we have regarding Li-Po batteries is that their technology is evolving very quickly. The battery models that we tested last month may no longer be available this month. For example, we ordered two 11.1V 500mAh (10C) batteries and received the 11.1V 800mAh (10-15C) batteries that had now replaced that "old" product line (at the old price point). We were also concerned that the manufacturer does not label their batteries with model numbers. The rapid advancement in battery technology is great, but it makes it difficult to use components that have been well characterized. West Mountain Radio - CBA II - Computerized Battery Analyzer and supporting software. Keithley 2100 6.5-Digit USB Digital Multimeter and supporting software. The discharge rate of our flight computer (waiting for launch) is 100mA, so that is the discharge rate we programmed into the CBA analyzer. We attached the battery to the analyzer and recorded the discharge data. The test was continued until battery voltage dropped below 7V (9V for the 11.1V batteries). Batteries were rested at least 24 hours between discharge and charge operations. During our first test using the CBA analyzer, the computer attached to it froze, resulting in the deep discharge of 7.4V Li-Po battery #1. The deep discharge damaged the battery (would not take a full recharge) so we excluded it from the results discussed below. A second similar incident occurred with 7.4V Li-Po battery #2. We reset the computer in time to save the battery, but its first test results were lost. After that we monitored the test very closely and were able to detect and correct hangs before they effected the tests. We also switched to a faster dedicated computer. This change eliminated the hang problems. We tested one new 9V Alkaline battery, one nearly expired 9V Alkaline battery, and all the LiPo batteries using the above method. The thermal element of our pyro event device is equivalent to a 3.4-ohm resistor. We wired the Keithley meter to measure the voltage across the resistor and report it to the computer every 500 milliseconds. The voltage recording was started. We then connected the battery to the resistor for a period of about 20-seconds. Then the battery was disconnected and allowed to rest for 40-seconds. This sequence was repeated 10-11 times. Our first high current test using Alkaline batteries was performed on the nearly expired Alkaline battery. The 9V Alkaline batteries are not designed for high current use. The 100mA test is at the limit of its rated performance. The battery has a relatively high internal resistance, so trying to draw over an Amp from the battery significantly reduced the voltage at its terminals. After the first test, it was clear that a single 9V Alkaline battery would not be able to power our 18W heater, so we placed two new 9V Alkaline batteries in parallel for the next test. During the 100mA tests, the performance of the new Alkaline batteries matched the manufacturers specification. The nearly expired battery performed far worse than the specification. I was also surprised how quickly the voltage of the Alkaline batteries dropped. I expected the battery to maintain a voltage very near 9V until it neared the end of its life, then to quickly degrade (similar to the discharge curves of the Li-Po batteries). 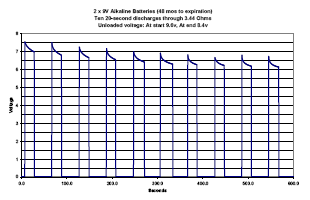 Within 25 minutes of discharge, the 9V Alkaline battery voltages dropped below the levels of the 7.4V Li-Po batteries. The Li-Po batteries began their tests at about 4.2V/cell and maintained their voltage above 3.7V/cell until very near the end of the test. For the first few discharge/charge cycles, battery life lengthened after each charging. During the 2.3A tests, the nearly expired Alkaline battery seemed to get stronger as the test progressed. The internal resistance of the battery limited current to just over an Amp. The battery was very warm after completion of the test. The two new 9V Alkaline batteries in parallel were able to source about 1 Amp each. The pair of batteries was able to deliver about 14 Watts to our heater element and noticeable degradation started to occur after the second discharge event. Both batteries were very warm after completion of the test. The 7.4V Li-Po battery was able to deliver over 2.3 Amps and achieved over 18 watts at the heater element. It was still delivering over 17 Watts after eleven discharge events. There was no noticeable temperature change for this battery. We also dissected one of the batteries to determine the method of cell interconnection. It appeared that the electrical contacts were spot welded to the cell electrodes. We saw nothing that made us concerned about the battery's ability to reliably supply power during Hi-G events. The electrolyte in these batteries is a polymerized gel. Since the battery does not have a rigid case, there is some concern that high G-forces could cause the battery to deform. Until this gets more fully analyzed, we decided to mount our batteries flat against the rocket bulkhead. We had previously limited our use of 9V Alkaline electronics (100mA) batteries to one flight per battery. The data received during these tests validate that decision. An 9V Alkaline battery would have no trouble igniting several e-match events, but would not be able to power our heating element. Even two 9V alkaline batteries in parallel fell a bit below our 18W goal. Our original thoughts were to use rechargeable batteries in our avionics electronics and make a cradle, which would recharge them (while still inside the avionics unit) while we prepared the rocket for its next launch. These results show that by using Li-Po batteries, we would not have to recharge between launches. We could launch several times on one battery charge. Even though our flight computers were designed to use a 9V Alkaline battery. We determined that it was not necessary to use an 11.1V Li-Po battery to power them. Our flight computers are rated to work down to 7.3 volts. 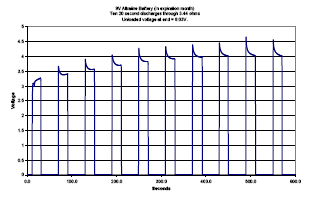 The 7.4V Li-Po batteries that we tested could maintain a voltage above this limit for about 8 hours of use. Using the 11.1-volt battery would also cause a problem, because its initial voltage (12.6V) exceeds the maximum voltage rating for our flight computers. Check with the manufacturer of your flight computers to determine the minimum and maximum voltage levels. They will vary by both manufacturer and model. A "too high" electronics battery voltage can easily be fixed by adding a power diode or two to the circuit to drop the voltage. Hopefully, the next generation of rocket flight electronics will better support the voltages produced by Li-Ion/Polymer batteries. Also, a Lithium fire is a bad thing (check out you-tube). Li-Po batteries contain a lot of energy and must be treated with respect. Study them before you use them.